Appeared on SUN Tv "Pattikada Pattanama" and Jaya TV "Galatta Kutcheri" with Mano sir on 15th Jan. I performed at the Thiruvaiyaru Tamil Isai Festival on the 15th. The concert was between 11:30 pm and 1 am (yes you read it right! ), and the audience were sitting and listening to music well into the night. Earlier I visited the Panchanatheswarar Temple and Dharmasamvardhini temple. This was the place where Dikshitar composed the Madhyamavati piece Dharmasamvardhini, and Syama Sastri composed the Varali piece Karunajoodavamma. In Thyagaraja's Muripemu Galige also there in a reference to Panchanatheeswara temple in the charanam. Very large premises, and nice darshan. Also prayed at the Aatkondeswarar sannidhi. A nice change from the city lights! On Jan. 9th I was at the capital, New Delhi...freezing as it was, I had the good fortune of landing within hours of the concert armed with a mere shawl and muffler. Mr Motilal Vohra was the chief guest for the evening, and several other dignitaries were supposed to attend the "Isai Kurisil" Award ceremony at the Delhi Tamil Sangam Audi, Dharam Marg. 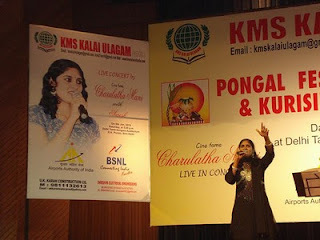 The concert was billed as "Charulatha Mani" - Live in Concert. It was a light music show Delhi Tamils were eagerly looking forward to. I was excited and delivered the goods. 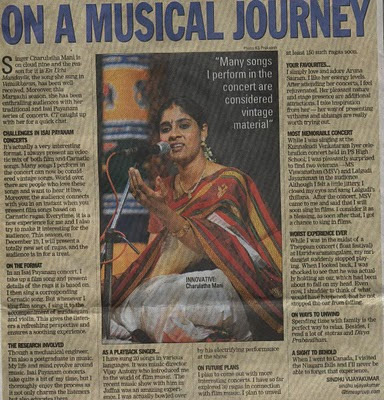 Smt Barkha Singh, MLA honoured me with the title, and the concert was a resounding success. It was a fine day at Colombo, on Jan 3rd, and the stage was set for a massive show at the Kadiresan Auditorium, Colombo. Presented by Vetri TV, this show included singers Srimathumitha, Mukesh, Jayadev, and myself. It was a grand show with a large youthful crowd. "Enn Ucchi Mandaila" was as usual received with thunderous applause and screams. I cannot forget my happiness while singing "Kanne Kalaimane" from Moondrampirai. The next day we shopped like crazy in Colombo and rushed to catch the flight. A hectic visit, and memorable evening. I sang at the Parthasarathy Swami Sabha for the season on the 1st Jan. I had a lovely audience and since it was Thiruvadirai Day of Arudra Darshan I sang mainly pieces on Lord Shiva. The highlights of the concert were "Siva Siva" of Thyagaraja in Pantuvarali and "Aadum Deivam" of Papanasam Sivan in Kambhoji raga. I included a new abhang "Eyegathu" in Revati raag as a tail-piece and as always it was very well-received. A fine start to a fantastic year. Dear cyberians, have a great year ahead, take care and god bless.